Empty Nest: Are You Ready to Par-TAY? You may be wondering where I am today. I am not here at my usual post. No, I am busy putting on my virtual party dress and getting ready for a rare event – an on-line house party! 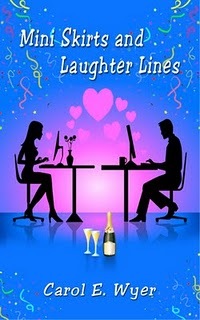 Yes, a proper on-line party to launch Carol’s debut novel MiniSkirts and Laughter Lines. It should prove to be a fabulous opportunity to meet new bloggers and friends; a huge cyber gathering, so come on and join me. I can invite as many guests as I want and you only need to bring a sense of fun with you. You will be able to mix and meet a variety of people from Blogland. There will actually be virtual games (have you ever tried ‘Pin the tail on a virtual donkey or virtual juggling?’), virtual food – you won’t get fat on that, music of your choosing. There is a ‘Mini Skirt’ competition with a few surprises. Please, pretty please, come and vote for me – I really want to win the special laughter line gel pen and makeup. There is also a ‘Laughter Line’ contest where you can vote for your favourite joke – an event which should bring a smile to your face. In various ‘rooms’ you will be able to mingle and ‘chat’ to other bloggers and ‘A’ list celebrities. There are even some Guests of Honour. There will be virtual dancing and of course, as it is a book launch party, the opportunity to read some of Carol’s very entertaining novel and even win a copy. Have you read the book already? Then come over and leave a comment – it could win you a prize. Are you on Facebook? Then ‘like’ Carol E Wyer’s page and answer the question ‘What film/book or television series makes you laugh most?’It could win you a copy of the book. See y'all there! Be there or be SQUARE! I'll meet you there! By the way - are you entered in the mini shirt contest? I was there last night. Lots to do and many things to win. Fun! I've been popping in and out all morning. It's a fabulous party with lots of food and drink (and fireworks!!!). Hope to see you later on perhaps. Carol has done such an amazing job with it all. Hey y'all! I've been having a BLAST over at the party! If you haven't been, you are definitely missing out! Come on over! Kara- the lovelies are in the contest! Alessandra-YES! Look for me, I'll be there! Diane- I was late but I'm over there now! Popping over to say HI back. Carol's giving a great party! Love your blog. I'm following this one, too. Darlene- Thank you so much! Wasn't the party an absolute BLAST?! Fun party, I'm heading to bed now so will have to check in the morning to see who won all the fun prizes! ...sounds like a bunch of hilarity going on here. I'll have to go find the link in your post and vote for you. Of course I will. ...guessed I missed it. As I commented on Carol's blog, I'm always a day late and a dollar short. Did you win? Oh baby, could this old gal use some great wrinkle cream. I just celebrated #59 last week. Oops...did I type that out-loud? God bless ya and have a most beautiful day sweetie!!! !